Over time the elements and other environmental factors take their toll on your roof. This issue is amplified by the fact that from the 1950s onwards, use of traditional slate roofing files declined in favour of cheaper pre-cast concrete files. Often available in vibrant colours, architects favoured these roof files as they complemented their bright and modem designs. Unfortunately pigment and pre-cast technology was not as advanced as it is today and the roof tiles' original vibrant colours faded to the now familiar dull grey. In addition, quality varied and some files have proven to have a design life of only 25 years. Today in extreme cases the file surface can actually break down and become porous, resulting in moisture retention and encouraging the growth of unsightly moss, green mould and lichens. The retained moisture also increases load on the roof trusses and ultimately leaks to the inside walls, showing up as damp patches. In most cases a roof renovation, including careful repair of structural defects followed by application of Kolourseal, will restore the roof tiles' vibrant colours that originally made them so appealing, and re-seal them against future damage from the elements. 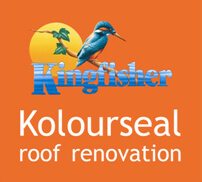 Why use Kingfisher "Kolourseal" Roof Coating? Kingfisher has been manufacturing outstanding waterproofing products for the construction industry for over 20 years. "Kolourseal" roof coatings use the latest polymer technology to produce a highly durable and attractive finish to your restored roof. Formulated using premium grade UV light-fast dyes, Kolourseal roof coatings re-seals porous clay and concrete roof tiles and adds spectacular depth of colour to all kinds of faded or discoloured roofing materials including concrete, clay, metal and even asbestos. For most of us our home is our biggest asset and it has been repeatedly demonstrated that well maintained and fresh looking properties sell faster and command higher prices. "Kolourseal" is an advanced micro polymer system which will not only re-seal your porous roof files but will also transform and restore your old roof and add value to your property. Developed at our Lakeland factory and tested against the worst of the British climate, we believe "Kolourseal" coatings set new standards in severe weather protection. In addition the U.V fade resistant colours will give your home a lasting appeal. When used for complete roof restoration in conjunction with Kingfisher's Biocidal wash, Kolourseal can ensure along lasting roof renovation, making your roof look like new. All this at a fraction of the cost, mess and disruption involved in fitting a new roof. Where "Kolourseal" coatings are applied by an approved Kingfisher contractor, an optional 10 year guarantee is available on the roof restoration. Other colours available to "special order". Due to printing and screen rendering limitations colours shown are only approximate. More helpful information can be found on our kolourseal how to guide and product data sheet on the kolourseal product page.